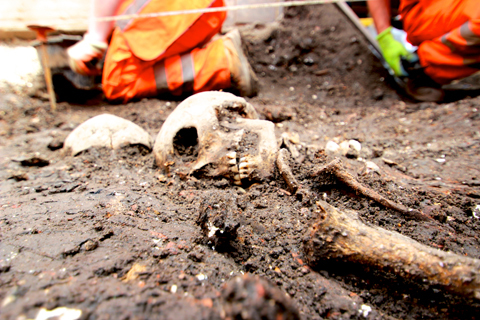 Crossrail archeologists are unearthing the identities of some of the 5,000 Londoners buried in the Bedlam burial ground at Liverpool Street. 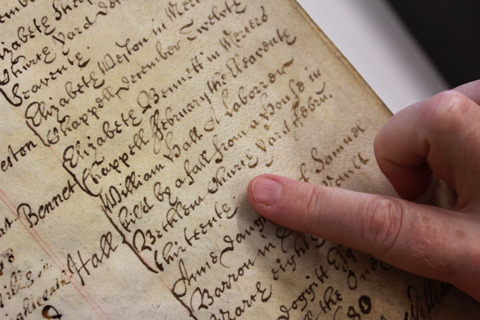 Volunteers have been scouring parish records to create a database of those interred in the 16th and 17th centuries. Among those whose remains will be excavated in the spring are astrologer Dr John Lamb, an advisor to the First Duke of Buckingham and Sir Ambrose Nicholas, Lord Mayor of London in 1575. While Dr Lamb was stoned to death by a mob following allegations of black magic, the commonest cause of death was the plague. Infant mortality and consumption also registered highly. The burial ground was established in 1569 to help parishes cope with overcrowding during outbreaks of plague and other epidemics. Crossrail workers recently discovered the gravestone of Mary Godfree who died in September 1665, as a result of the Great Plague which peaked that year. After excavation the skeletons will be reburied on consecrated ground. To date Crossrail has found more than 10,000 artefacts spanning 55million years of London’s history across over 40 construction sites. Her determination cleared a path for other women, and in 1876 a law was passed allowing women to enter the medical professions.